Here is a recipe and some tips for roasting potatoes. This dish is extremely versatile. I often make these as a snack or as a side dish. Yukon Gold Potatoes | 1/2 inch thick slices. It does not get much simpler than that. Place a rimmed baking sheet in the oven and preheat oven to 450 degrees. Place potatoes in some salted cold water in a pot on high heat. Once brought to a boil, reduce heat to a low simmer for about 5 minutes. Drain potatoes well and transfer to large bowl. Toss in salt and olive oil until the outsides of the potatoes are coated in a starchy paste (1-2 minutes). Quickly remove baking sheet from the oven, drizzle olive oil on the baking sheet and arrange the potatoes evenly before putting back in the oven. Bake until potatoes are crispy on the outside (around 20 minutes flipping after 10 minutes). Adjust seasoning and then finish with black pepper and/or herbs. Why boil the potatoes most of the way? Gently simmering draws sugars and starch towards the surface of the potato. This will help the caramelization in the oven. Why toss the potatoes roughly? Tossing the potatoes roughly increases the surface area. It does this by roughing up the surface and creating imperfections. This speeds up the evaporation. Caramelization can only occur after the surface water content has evaporated. This also increases the rate at which fat can be absorbed. The cooking method relies on water evaporation in order to create a crispy exterior. Yukon gold has enough moisture that it won’t dry out completely even though we’ve maximized the evaporation rate. We therefore end up with a crispy exterior and a creamy interior. Trimmed Pork Belly – cut into 2 inch cubes. 1. In a medium heated pot, slowly fry off the shallots in sesame oil. 2. Move the shallots to one side of the pot and make a light caramel with brown sugar. 3. Brown the pork belly in the brown sugar and deglaze with clementine juice. 4. Add coconut juice, ginger, thai chilli, fish sauce, and soy sauce. 5. Simmer on low for about two hours (or until falling apart to a firm touch). Make sure to stir occasionally. 6. 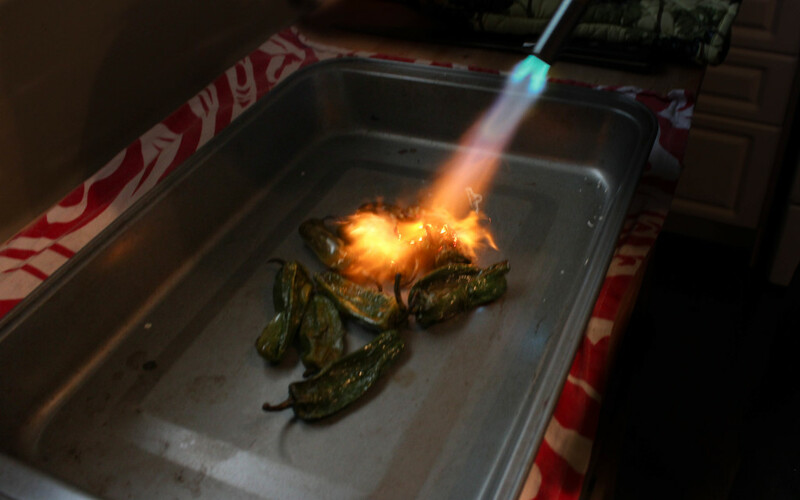 After turning off the heat, sprinkle on scallions to let them soften from the residual heat. 7. Serve over steamed rice. To make life easier for yourself before cooking anything, its best to prepare all the ingredients first. In french cuisine this is called mise en place which means putting in place. This practise is particularly useful when making things like fried rice. The actual cooking time for fried rice is quite short so its next to impossible to prepare things while you go. Usually, I pick ingredients for fried rice based on what I have left over in my fridge. It is a great way to get rid of the produce you’ve yet to use. For the best results however, its ideal to use the freshest and most vibrant of ingredients. 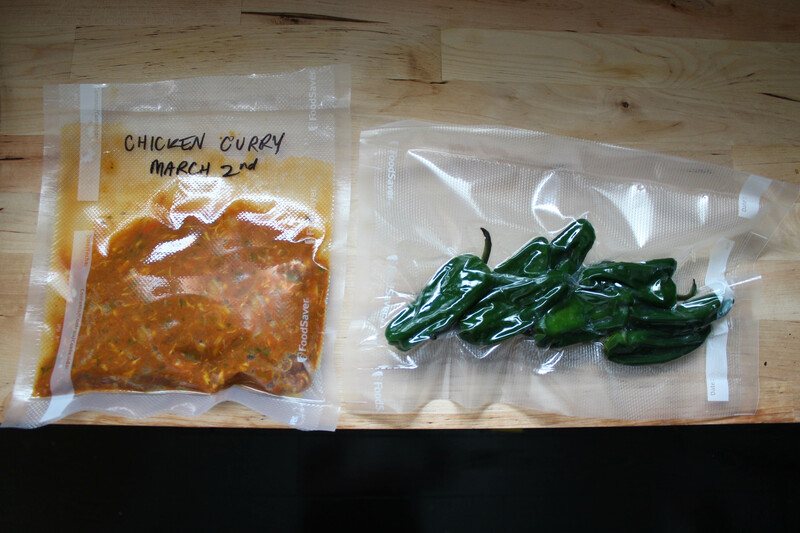 I often like to use fermented products for seasoning because they add a lot of savouriness without making the dish even heavier than it already is. Soy sauce, fish sauce, and Sriracha are my favourites. Some key tips for making fried rice. 1. A good trick is to use refrigerated rice. If the rice is freshly cooked it has a tendency to stick together and become mushy if fried right away. 2. Cook each ingredient separately. Each ingredient takes a different amount of time to cook. It is pretty hard to time everything if you are cooking it in one pan/wok. 3. Cook the rice last and fold in the rest of the already cooked ingredients. Microwaves are super popular. Nearly every home I’ve been in recently has one. People usually associate microwaves with convenience as they are far and away the fastest way to heat most food. Unfortunately, they’ve long been shunned by the culinary world. High end classically trained Chefs have turned their nose up at the notion of microwaved food on television. I can’t count how many times I’ve seen a Gordon Ramsay shame someone for even having a microwave. I’m not sure if this is done because old school Chefs do not understand how a microwave works or for another reason but its caused the general public to think microwaves are incapable of producing delicious food. Microwaves essentially work by producing electromagnetic waves that interact with polar molecules (mostly water) in food. By causing these polar water molecules to oscillate at a ridiculously high frequency, the electromagnetic waves increase the temperature of the food by using the food itself. The classic technique for boiling or steaming vegetables or any other food item is to wait until the water is as hot as possible before dropping the food in. This is because the longer the vegetable stays in the water, the more flavour and nutrients dissolves into the water. In fact, slowly simmering bones or vegetables is exactly how you extract the most amount of flavour when making a stock. Water can only exist in a liquid state up to 100 degrees celsius so there is a limit to how fast an ingredient can be cooked. Therefore, there inevitably is going to be some flavour and nutrients lost. Microwaves aren’t perfect but they cook food faster than any other method and the water that is cooking the food is inside the food itself so the flavour and nutrients is not extracted. This results in the most vibrant and nutritious result unmatched by alternative classic cooking techniques. Have you ever tried cooking something in the microwave from frozen? If you have you probably remember because the result is quite startling. If you haven’t, what happens is parts of the food ends up being fully cooked while other parts of the food remains completely frozen. This is because of the fact that frozen water has a different atomic structure than liquid water. Frozen water does not interact with the microwaves. The liquid water ends up cooking food near these molecules very quickly while the rest of the food is untouched. The defrost setting is simply the magnetron in the microwave oscillating between being on and off. 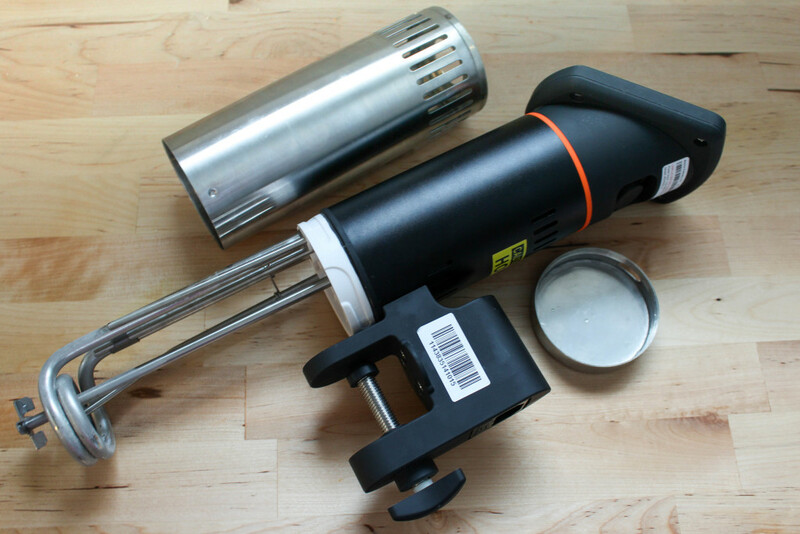 This allows for small increments in cooking around the liquid water molecules which in turn provide enough heat to melt the frozen parts of the food. This allows for more even heating than the standard microwave setting. Hopefully this has shed some light on the microwave, an appliance that has been grossly misunderstood for years. 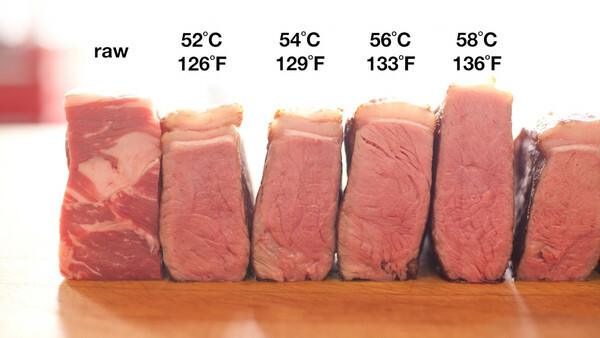 Sous Vide is a cooking technique in which an ingredient is heated at a consistent temperature in a water bath. Since the heat can be precisely controlled, the end results can accurately and consistently be predicted. Traditional cooking techniques involve using heat that is much hotter than the ideal internal temperature of the food. Think about how hot an oven, barbecue, or a frying pan gets compared to the temperature of food that is edible. This means that timing is crucial. With traditional cooking methods, the surface of the food is always hotter than the internal temperature. When food is taken off the grill or the pan to rest and wait for the cooling of the surface, the center becomes warmer. This is why when a roast is the perfect temperature when it’s taken out of the oven, it’s well overcooked by the time it’s sliced into. With a water bath that is set to the exact internal temperature of the food, the surface and the internal temperature are always at equilibrium. The water bath is also at that temperature so there is no danger of ever overcooking. This means that one can have horrible timing without worrying about the result of whatever is being cooked. What is even more convenient is that food can be cooked in advance and stored in the fridge until mealtime. This can take a lot of pressure off during busier times, like finals season. 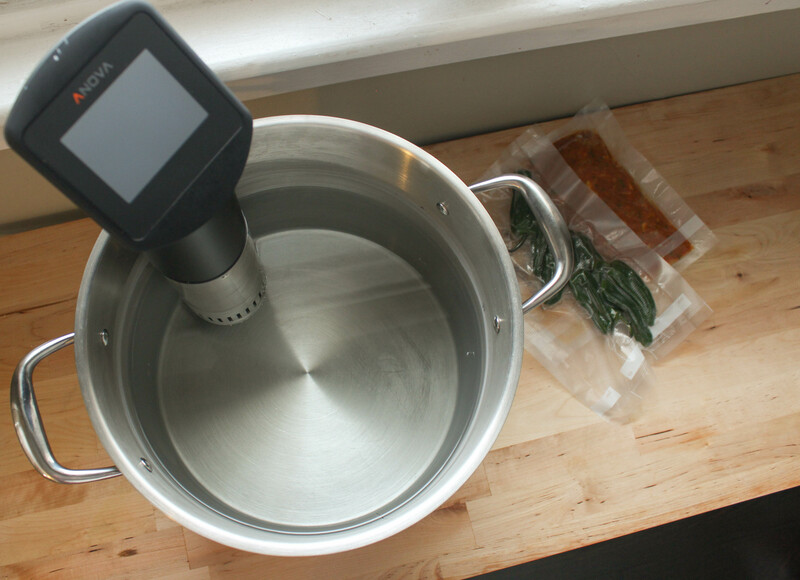 Cooking sous vide often requires a finishing step. 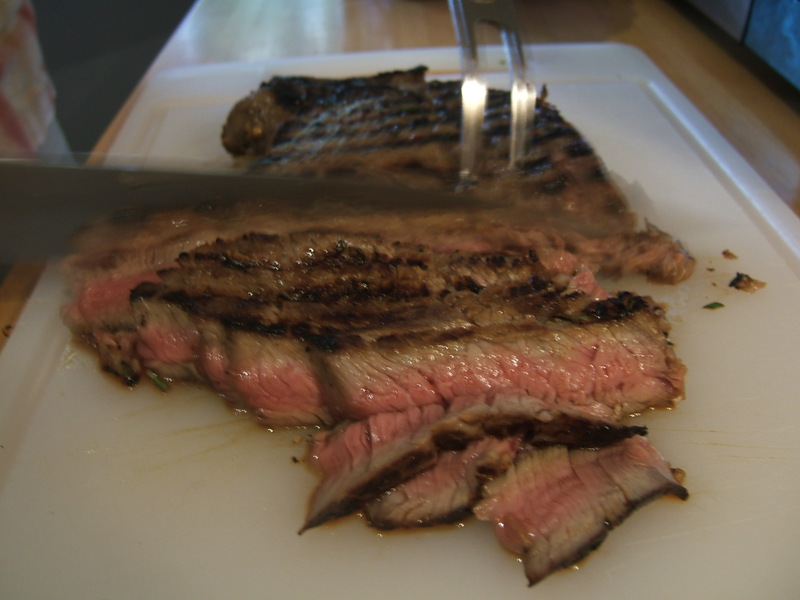 It’s usually desirable to alter the surface texture on something cooked sous vide, like a steak. 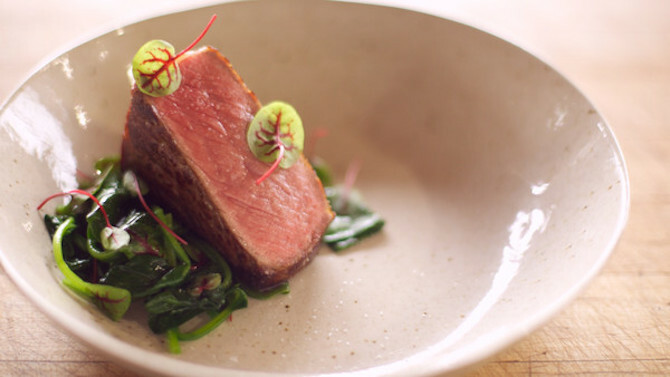 A crunchy and deeply coloured exterior is one of the hallmarks of a great beefsteak, so an additional finishing step is required to achieve this after the sous vide cooking process. This can be done in various ways whether it be in the pan, under a broiler, or even a torch if you are feeling fancy. Everyone has a preference for how they like their steak. The difficulty lies in describing your preference to whoever is cooking the steak. Everyone’s interpretation of popular steak adjectives like “rare”, “medium”, or “well done” is different. One person’s medium might be another person’s medium rare. Although these adjectives have a degree of ambiguity, it’s pointless to be more specific when using traditional cooking techniques. This is because even within one cooked steak, one can find areas that are cooked to a different degree of doneness. The center is invariably less done than the areas near the surface. Quantitative measures allow us to be specific about the level of doneness we prefer. The ability to precisely control these measures allow even someone with little to no culinary skills to be more consistent than the most masterful of professional chefs using traditional cooking techniques. The only two knives you need. Knives are often sold in sets, but who actually uses them all? Even culinary school can be done with two. So two for the rest of a non-professional cooking life is plenty. There are much better—and fun—ways to blow money than buying a bunch of knives to take up space in your kitchen. The most important thing about a knife is how sharp it is. I’d prefer a cheap, sharp knife over an expensive, dull knife every time. Sharp knives are actually much safer than dull knives. Dull knives often slip on foods, like tomatoes, and it’s only a matter of time before they slip onto fingers. It is also commonly found that after one gets used to cutting with a dull knife, their cutting technique involves a lot of downward pressure, making the case of the knife slipping all that more dangerous. Sharp knives never slip, since they always break the surface of whatever is being cut. This inevitably leads to less downward pressure in one’s cutting technique. Even if an accidental cut occurs, the pain is less noticeable. It is good to note that all new knives are sharp and that any knife can be sharpened. It may seem counterintuitive, but this is actually one of the reasons why the regular home cook may benefit even more from investing in good knives than a professional cook. Although all knives come sharp, some dull quicker than others. Since the average home cook doesn’t know how—or even want—to sharpen their knives, investing in a good knife with relatively resilient steel will ensure a safer and more enjoyable chopping experience. Your chef’s knife is your workhorse. This is the knife you’ll use for 90% of your tasks. If you could only choose one knife, this would be it. It’s the one you’ll be chopping, slicing, and even smashing with. This is the knife you’ll use for those hard-to-reach places or for cutting jobs that a chef’s knife might feel too big for. Most people use theirs for mincing garlic, pitting strawberries, cutting up fruits, and peeling the skin off things like ginger and onions. If you are going to put money towards a knife, it’s good to know what that money is getting you. The two most important things to look out for are comfort and the blade material. You’ll be holding your knife pretty often for the next few decades, so you might want to pick something that feels nice to hold. This means that it’s safest to buy the knife in stores where you can try it out or at the very least hold it. It’s ultimately up to you, but larger hands generally call for larger handles. A lot of people advise to go with an 8-inch chef’s knife, however it’s more important to pick the knife that feels most comfortable. For a home cook, a good quality stainless steel knife is the way to go. It’s easy to take care of and it’s extremely durable. This means that your knife will stay sharp longer. Naniwa Professional (Chosera) 1000 grit stone (sharpening stone), MAC Black Ceramic Honing Rod (honing rod), Takeada Stainless Aogami Super Banno Bunka 6.8″, Takamura R2 Petty 5.9″(paring), Mcusta Zanmai Pro Damascus Pakka Wood 8.2″(chef’s knife), Kanehide Hankotsu 5.9″(boning knife), Tojiro DP Serrated Bread 8.5″(bread knife). Unfortunately, there aren’t many places in Guelph with a good selection of high quality knives besides Casual Gourmet. If you want a second opinion and are willing to travel, Toronto is home to Nella Cucina; they supply to a lot of restaurants in Toronto. If you are feeling particularly fancy, Toronto also have Tosho and Knife. Another option is to order knives online. It’s a bit of a gamble in terms of how it’s going to feel in your hand, but it’s convenient and the prices are often the best you’ll find. You can find most knives on Amazon. A popular trick is finding the knife you want in a store and ordering it on Amazon for a better deal. If you want something ultra high end, Chef Knives To Go and Chubo Knives have pretty great selections. What makes a good knife may be personal, but anyone that’s had one will say it’s invaluable. Once you get your hands on one, you’ll never go back.